Your certificate shows a read-out of your DNA sequence (in purple) and, above it, a chart of human evolution with your place in the scheme marked by a star. Below the chart is a-read-out of the sequence of your mitochondrial DNA. We prepared this from the cheek cell sample you supplied. There are more details of the process on the sheet "How we did it . As you see, your DNA sequence consists of a long sequence of four different letters: A C G and T. These letters are shorthand for the four different chemicals which are strung together to make the long chemical chain we know as DNA. The exact order of these letters is a code which tells our cells how to grow into a human, how to divide and how to perform the many different tasks required of them. We have only read a small part of your DNA, four hundred letters to be exact. The total length of the DNA message is much, much longer - about 3000 million letters. You may have heard that scientists from the Human Genome Project have recently announced the completion of the first draft of this entire sequence. Why do we read the mitochondrial DNA? Most DNA is passed on to the next generation in sperm and eggs. Mitochondrial DNA (mtDNA for short) is special because it is only passed on through the egg. This means that everyone has inherited their mtDNA only from their mother. She has inherited it from her mother, who inherited it from her mother, who inherited it from hers - and so on back through time. This means mtDNA provides a direct and undiluted link to our maternal ancestors. We all inherit many other genes from many other ancestors but only mitochondrial DNA traces this direct maternal line. Your mtDNA sequence is printed below the chart. Think of it as a very long word with four hundred letters. To compare the different spellings we find in different people we use what we call a reference sequence, actually the most frequent sequence found in Europe. This is printed in purple. Where your sequence differs from the reference spelling' we have picked out the letters in red*. This is the DNA sequence which has been passed on to you virtually unchanged from your remote female ancestors. If all the letters are purple then your mtDNA sequence is identical to the reference. When cells divide, DNA has to be copied. Fortunately for us humans, this is an extremely accurate system and mistakes occur only very rarely. When they do, they are called mutations. If they happen in a gene responsible for an important cell function, they can give rise to severe inherited diseases like cystic fibrosis or muscular dystrophy. However, the great majority of mutations occur without having any effect at all. Mutations in the section of mtDNA we sequenced have no consequences whatsoever, but they are extremely useful for studying our ancestors. 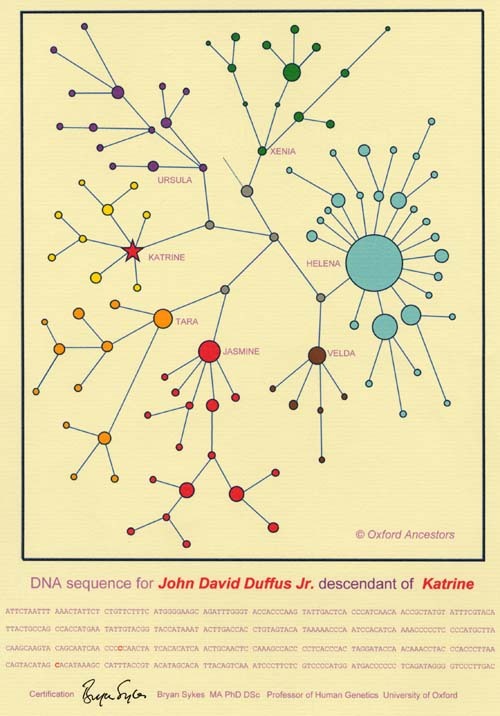 We now know that, on average, one mutation occurs in mtDNA every twenty thousand years! the dashed line. Like the other grey circles, we have not found this DNA sequence in any living person but we know from our reconstructions that it must have existed. How does my DNA fit into the chart? The chart position of your own sequence is shown by the star. It belongs to one of the seven different groups or clans, each shown by a different colour. The members of each clan are all descended from a single female ancestor through the direct maternal line traced on the chart. We call these women "The Seven daughters of Eve . From your DNA sequence we are able to tell which clan you belong to and which of these seven women was your maternal ancestor. This is shown on your chart. The Seven Daughters of Eve. It is an entirely logical yet still awe-inspiring fact that we are all related to each other through our mothers. Over the past ten years, our research has identified just seven women, who lived thousands of years ago, from whom almost everyone in Europe is directly descended through the maternal line. We have calculated how long ago these women lived and even estimated their whereabouts. We know they survived and that each had daughters, starting off lines of descent that reach right down to all of us. These were real people, real women who brought up families but in very different circum- stances to those we enjoy today. These really were our true ancestors. We have given them names and here are their stories. One day in the autumn of 1991, two hikers enjoying a late Summer holiday in the Alps, strayed off the main path and crossed the head of a small glacier. To their astonishment, protruding from the ice was the head and upper torso of a man's body. At first supposed to be the remains of a music teacher who had been reported missing two years previously, it was only when the renowned alpinist Reinhard Messner realised that the small axe found near the body was made not of steel but of copper, that the importance of this find sunk in. This was the Ice Man, a hunter who had lost his way and died of hypothermia some 5000 years ago. When we analysed the DNA from a small fragment of bone, we saw clearly that Oetzi, as he became known after the valley at whose head he was discovered belonged to the clan of Katrine. Katrine lived 10,000 years earlier on the Southern slopes that run gently down to the sea near Venice. She lived on fish and crabs from the lagoon, supplemented with whatever small mammals and roots could be found in the woods that covered the narrow plain. As the glaciers retreated and the snows fell only in winter on the Alps, her children ventured farther North into the valleys to hunt the marmot and the ibex. When it became warmer still they crossed the great range and moved up the valley of the Rhine to meet the North Sea. Her clan is still found in the Alps, five thousand years after the Ice Man, as well as over much of Northern Europe. Ursula lived about 45,000 years ago in Northern Greece. She was among the first arrivals of a new, modern human to set foot in Europe. She was slender and graceful, in marked contrast to the thick-set Neanderthals with whom she and her clan shared the land for another 20,000 years. Her kind brought with them a new and more sophisticated type of stone tool with which to hunt and butcher the abundant game, animals which soon appeared on the walls of limestone caves as the first expression of art. They spread right across Europe, West across France and North as far as Britain. As the climate deteriorated 25,000 years ago the clan began its long migration to the South, eventually reaching Spain and founding what became a refuge for all humans during the coldest millenia of the last Ice Age. As the climate warmed the scattered clan led the march north to reclaim the once frozen lands. They reached Britain and left an indelible record in the limestone caves of Cheddar Gorge. In 1998 we recovered DNA from the famous skeleton known as Cheddar Man and showed it belonged to the clan of Ursula. In a dramatic demonstration of genetic continuity, we found that DNA from a teacher at the local school, only a few hundred yards from the cave entrance, was clearly a member of the same clan. Of all the clans, Xenia's is the most mysterious. We know she lived about 25,000 years ago, in one of the remote wooded valleys of the Caucasus Mountains on the eastern edge of the Black Sea. There she feasted on chamois and mountain goat, always wary of wolves and the ferocious cave bears which competed for the best shelters. As the climate grew worse with the onset of the last Ice Age, her children left the rapidly cooling mountains and spread out to the East and West. They must have been prodigious travelers because her clan is now found not only all over Europe but also, intriguingly, in North America. This must mean that a few members of the clan traveled right across Asia and joined the first expeditions across the dry Bering land bridge and into the Americas. Tara lived in Tuscany about 17,000 years ago. Then Europe was in the grip of the last Ice Age and the only parts of the continent where life was possible were the lands bordering the Mediterranean. Then, the Tuscan hills were a very different place. No vines grew, no bougainvillea decorated the hillside farms. It was thickly forested with pine and birch. The streams held small trout and crayfish, which helped Tara to raise her family and held the pangs of hunger at bay when the menfolk failed to kill a deer or wild boar. As the Ice Age loosened its grip Tara's children moved round the coast into France and joined the great band of hunters who followed the big game across the tundra that was Northern Europe. Eventually, Tara's children walked across the dry land that was to become the English Channel and moved right across to Ireland, from which Celtic kingdom the clan takes its name. Whether just by chance or by the guiding hand of natural selection we do not know, but Helena's clan has grown to become the most widespread and successful of the Seven Daughters of Eve. Her children have reached every shore, settled every forest and mountain range from the Alps in the South to the Scottish Highlands and the Norwegian fjords in the North, even to the Urals and the Russian steppes. Helena was born about 20,000 years ago in the strip of land that joins France and Spain near what is now the town of Perpignan. Her family were hunters, of course, but they also harvested the rich oyster beds in the lagoons of the Camargue. Not long before they had arrived from the Middle East, pushing their way along the Mediterranean, constrained to the narrow strip of land that was still habitable. Not long after she was born, the glaciers that covered the Pyrenees, which she could see on a clear day only thirty miles from her camp, began to draw back as, little by little, the summers grew warmer. Some of her clan moved south of the mountains, up the valley of the Ebro to the West to reach the lands of the Basque, where they remain to this day. The most adventurous of her children took advantage of the climatic improvement and journeyed ever northwards to join the great movement of hunters across the plains of France. We know they reached England 12,000 years ago because DNA we recovered from a young male skeleton found in Gough's Cave, Somerset shows he too belonged to the clan of Helena. Velda lived in Spain 17,000 years ago. Her parents had journeyed to this warm refuge which they shared with the clan of Ursula, who had retreated from the frozen North. She was too young to have encountered the last of the Neanderthals who disappeared from Iberia ten thousand years before and she and her clan played no part in their extinction. Even so, there was conflict between her clan and that of Ursula as both competed for the meagre resources this mountainous land had to spare. But once the weather began to warm up, the old quarrels were forgotten and children of both clans could push North around the strip of land to the West of the Pyrenees and into the plains of Gascony and slowly over the next three centuries across France and into Britian. Eventually, a few members of her clan edged up the still frozen seaboard of Norway to the far North where they joined pioneers from Arctic Russia to become the Lapps, or Saami, of northern Finland and Norway where they remain today. While the other six clan mothers had to endure the hardships of the European Ice Age to bring up their children, Jasmine was enjoying the comparative warmth of the Syrian savannah. Life was good. The spring and autumn migrations of gazelle passed through her territory and provided a supply of meat which could be dried and made to last. There were sand grouse to trap and abundant small game on the open grasslands. So reliable was the food supply, that it became unnecesary to move from one temporary camp to another. Jasmine was born in one of the first semi-permanent camps that would eventually become the villages and towns most of us now inhabit. With the pressure to spend all the time searching for food removed, there was time to experiment. A man from a settlement nearby had found that the dried seeds of wild grass could be collected without much trouble and made a tasty alternative to dried gazelle. Someone else found some larger grains on a distant hill and spilled a few at the campsite. After the rains, he noticed that the seeds had grown into new plants and that they, too, held the large grains of their parents. Thus began the greatest shift in human evolution, the invention of agriculture. Soon the population began to grow as wheat replaced meat. Brave souls captured wild sheep and cattle and fed them with the new crop. Slowly, over the years these animals lost their savage tendencies through the first selective breeding and settled to a life of domestication, where they remain. Before long, it was getting crowded and so it became the custom that the second Sons moved away to establish their own farmsteads. Slowly at first, the children of Jasmine spread across Anatolia and into Greece. Then the bands split up. One forced its way across the Balkans and up the fertile valleys of the Danube and the Elbe, tilling and planting in the fine soil formed by the wind blown particles ground from the mountains by the retreating glaciers. The other band took to the sea, heading round the Mediterranean as far as Spain and Portugal. But they were not arrivals in an empty land. At every turn they encountered the hunter-gatherers. At first, these were uneasy confrontations, but as the hunters realised they faced no competition from the much slower farmers who couldn't catch a deer to save their life, the process of integration began. Little by little, the proud hunters abandoned their nomadic ways for the comparative comfort and security of life on the farm - a way of life brought to Europe by the children of Jasmine. Copyright 1999 - 2001. All rights reserved.